TESLA WEBCAST: Is The Worst Yet to Come? “The worst is yet to come,” embattled Tesla CEO Elon Musk told the New York Times recently. 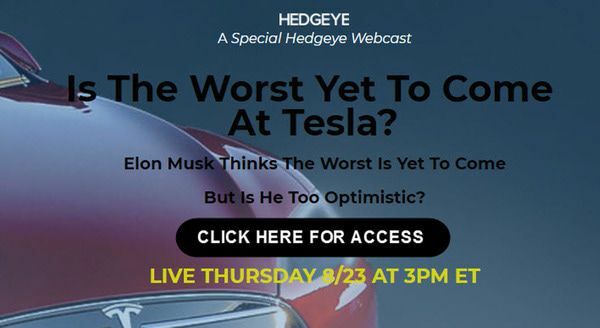 That’s why we hosted a special Tesla webcast with outspoken Tesla critic Chris Irons, founder of Quoth the Raven Research, and Hedgeye Industrials analyst Jay Van Sciver to discuss what lies ahead for Tesla. And yet, it’s not short-sellers that are the biggest risk to Tesla shares. The biggest risk is slowing demand for Tesla cars. You don’t want to miss this webcast on this battleground stock.